Artur Noga, Samuel Coco-Viloin, Konstadinos Douvalidis, Dennis Martin, Darius Reed, Wojciech Jurkowski, and Vladimir Zhukov may soon replace all the old—timers in the finals of the 110 m hurdles. Their times range from 13.23 for Noga’s Polish national junior record to Zhukov’s 13.53 seconds ran over 99 cm high hurdles. These men – just mentioned – seem to be a near—future star—loaded. The Poles, the French, and the Russians are not traditional powers in the men’s short dash hurdles, but because these non-traditional states have been able to produce exceptional short sprint—hurdlers, as did China recently, the field is soon—to—be overloaded with talent. Another thing to look out for in 2007 and 2008 may be a new world record (or world best) in the 4 x 200 m relay: the young wave of the US dashers has come out of age and performs superbly not just back home, but improves their own personal best on the European and world circuits as well. Xavier Carter, Wallace Spearmon, and Tyson Gay all have run 200 meters under 19.70 seconds last year. The only occasional threat to their dominance may come from the Jamaicans: Usain Bolt and Asafa Powell who ran 200 m in 19.90 seconds or better the last year. The US quartet of the 200 m dashers who broke 20 seconds barrier last year is completed by Jordan Vaden ( 19.98 seconds personal best in 2006 ) who is followed by an ex—African now--European sprinter Franics Obikwelu of Portugal with 20.01 seconds 200 m season’s best last year. It would seem that picking Carter, Spearmon, Gay, Bolt, and Powell as the 200 m finalists for the world championships in 2007 and the Olympics in 2008 one cannot make much of a mistake. The challenge is always finding enough competition on all 4 legs. In such a rarely run event, few countries can field 4 good runners. I do agree with you, Dan: even if the other top four sprinters would get their exchanges perfected, they may not be enough of a challenge for the US dashers' quartet to force them to establish a new world record. Moreover, except for the Jamaican duo, and one African--European, there is no one to fill the fourth spot on the relay. A "regional" all-star squad is the only option I see. I agree, but even the "regional" all-star squad may not be enough. 2. April Steiner (USA) 4.60m"
Lately, the “box” has been crowded nearly exclusively by the Russian and Polish women; this year, however, the US female pole vaulters will challenge the status quo. Whoever wins medals in 2007 and 2008 will face progressively sturdier competition. One must keep in mind that the Japanese and the Chinese, as the hosts, are rushing to catch up. Hey, Has anybody seen the Carifta 100m finals video: Schoolboy Yohan Blake @ 17yr ran a PB of 10:11secs. The commentators said he had a bad start !! Location? Doesn't sound like the US. You forgot to add me there I plan on taking the gold and setting a new world record for 100m. Watch out!!! 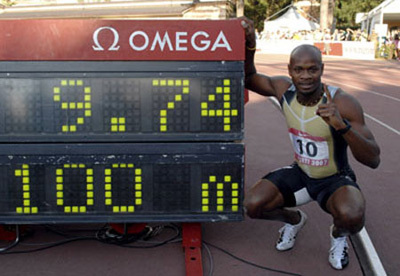 op684, Asafa Powell broke the 9.77 record by .03 of a second this September.